Home Uncategorized Eden Hazard and Tiémoúé Bakayoko are back in full training! 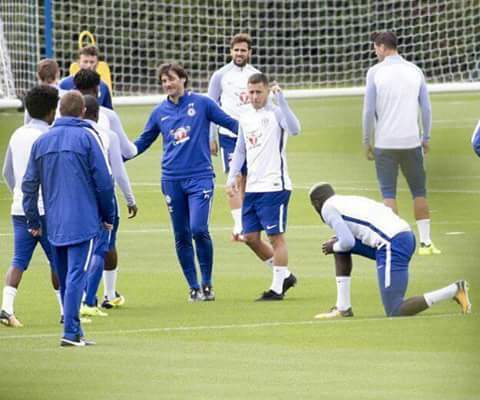 Eden Hazard and Tiémoúé Bakayoko are back in full training! Chelsea forward, Eden Hazard and new signing Tiemoue Bakayoko have resumed training. However, they are not likely to be fit enough to feature against Tottenham on Sunday. Both men participated in training sessions at Cobham on Tuesday. Bakayoko also posted about his return to training on Instagram. Hazard was not available in the entirety of Chelsea’s preseason due to a broken ankle sustained while on international duty with Belgium in June. Also a knee injury has delayed Bakayoko’s debut since arriving from Monaco in a £40 million deal. Hazard and Bakayoko’s return to full training is a timely boost for head coach Antonio Conte. Chelsea will face bitter rivals Tottenham on Sunday at Wembley. Pedro Rodriguez missed Saturday’s shock 3-2 defeat to Burnley at Stamford Bridge with an ankle knock, while captain Gary Cahill and Cesc Fabregas are both suspended for the Spurs game after being red carded.